Big update released v0.14 (5.0.0), just run the Alice Launcher to automatically update it. This update was almost more effort than its worth (I had to learn to write raw HTTP requests), but I'm sure the effort wasn't for nothing. The biggest change is that mods are much easier to manage now. The mod manager now actually works properly. There is an in-app store to download mods and styles. Mods are automatically updated. Theres a few dummy buttons added that do nothing yet, the styles tab isnt finished yet, uploading mods or styles is a bit dodgy and there may be a few download issues, but they are all being fixed right now. Alice 2.4 broke this. I fixed it. I extracted the program code from my old broken computer, fiddled with it until I could use it and fixed it so that it works with Alice 2.4 (such that the same fix shouldn't need to be done for any future Alice updates) and fixed a bunch of warnings and errors under the hood. No features have been added, modified or removed, what wasn't fully implemented before still isn't. But, now it works again, so great. It should automatically update if anybody still has it installed (which I doubt), if you use the installer, then it will install the latest version (1.0). Still awesome, after all these years. Having issues with the mod tab not being displayed? Thanks X, nice to see that you are still here and active, that's awesome. You have to run that instead of the Alice exe, this just means Alice is still usable as normal if this breaks. If that isn't there, then something is wrong. (Image was massive, click for full resolution). That is inside the Alice Launcher window before Alice launches, you can click to launch Alice from there (or set it to auto launch next time). If all that fails, then either its not installed properly, or I need to fix something. Do you mean the mods menu in Alice? Because that won't show up until you install any mods, which you can do from the mods tab in Alice Launcher. 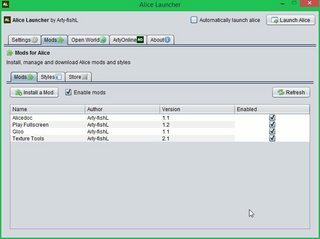 Is Alice Launcher showing up to begin with? Is the Help menu label there like in the picture above? 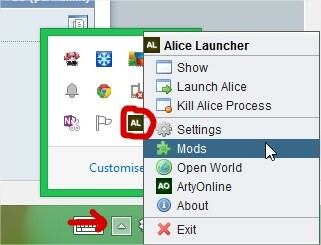 So, in Alice Launcher, before Alice has started, you go to the mods tab like in the picture above. Then you can either download a mod from here and install it, or you can click on the "store" sub-tab and install a mod from there, that'll probably throw up an error, just click to continue and ignore it, it lies. Then, if Alice was already open, close it, because installed mods won't take effect until Alice is restarted. 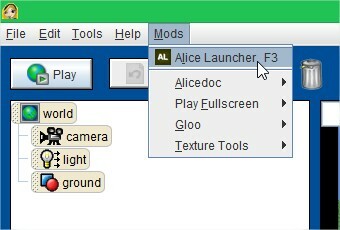 If it's not open, then just click the "Launch Alice" button from the top-right of the Alice Launcher window. Finally, once Alice is started, you should have that menu. Last edited by arty-fishL; 04-27-2015 at 09:08 AM.